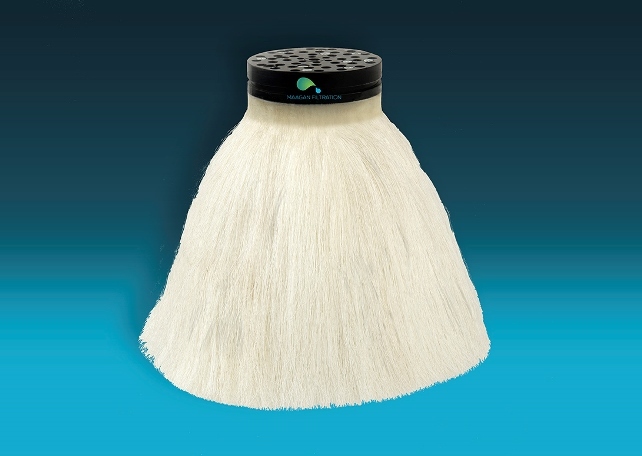 Our Sheaf Filter represents a new and innovative implementation of thread-filtration technology. Our groundbreaking technology is based on the flow of contaminated water lengthwise, along the threads, rather than crosswise, as in other fiber-based filters/cartridges/membranes. Our Sheaf Filter combines both major filtration methods: “physical filtration,” in which the filtration level is determined by the pore size, and “depth filtration,” in which suspended solids are intercepted and adhere to the media through which the water flows. This unique combination of filtration methods results in an un-paralleled filtration performance, as compared to other self cleaning filters. The Sheaf Filter uses threads that loosen on one side of the filter, and therefore has flexibility and movement. This enables the thread-sheaf to move into a small, tight chamber by water pressure during the filtration stage, and to move in the opposite direction, loosening and opening up the filtration channels during the back-wash stage. MAAGAN FILTRATION continuously develops new, specialized threads with modified large surface area and a different cross section; all ensuring superior filtration. We believe that our innovative R&D gives us the strength to stand in the forefront of water technology with the next generation of filters- the Sheaf Filter.